Yes, as I have been delinquent about writing lately, here are two tasty photos of things I have eaten in the past few weeks. The taco is from Izzoz, a new trailer over on S. 1st, close to home! 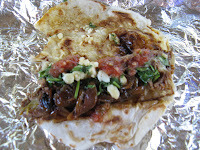 It's the "Slowrider" -- braised machaca beef, cotija cheese, caramelized onions & cilantro. And for $3, it was delicious! Izzoz sits in the same lot at Holy Cacao, a "cake ball" purveyor... think cookie dough on a stick with icing! yum that breakfast looks particularly good. 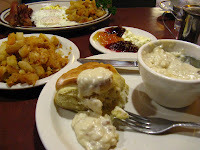 is there a SouthAustinFoodie twitter feed? Hey homey! Come to Austin for some food! Sorry, no tweeting here!